Acting upon a promise to recover “ill-gotten gains” from illegal supergraphic signs, City Attorney Carmen Trutanich has filed a lawsuit seeking millions in damages from CBS Outdoor and four property owners, including the owners of downtown’s historic Figueroa Hotel. The lawsuit filed Feb. 1 in Los Angeles County Superior Court alleges that CBS Outdoor, a division of media giant CBS Corp., maintained illegal supergraphic signs at a total of four locations downtown and in Hollywood, some as long ago as 1997. The city is seeking penalties of $2,500 a day from both the company and the owners of the four properties, a figure that could potentially add up to tens of millions of dollars. 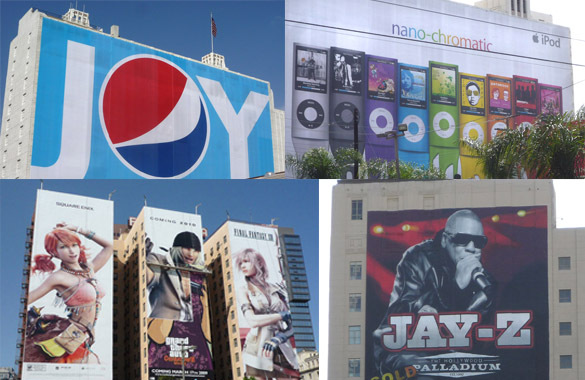 Supergraphic signs have been known to generate as much as $80-100,000 a month in prime locations. In addition to the Figueroa Hotel at 939 S. Figueroa St., the properties alleged to have had the multi-story, vinyl advertising signs either attached to the buildings by adhesive or bolts and cables are the Iron Mountain Film and Sound Archive at 1025 N. Highland, the Equitable Building at 6253 Hollywood Blvd., and an office building at 155 W. Washington Blvd, which is the only one of the four that isn’t on the state’s register of historic buildings. According to the lawsuit, orders to remove illegal supergraphic signs from the former Toberman Storage building at 1025 N. Highland in Hollywood were first issued in June, 1997. Further orders were issued in March, 1999, June 1999, September 2000, September 2001, and April 2006. The signs on both sides of the 14-story building were removed after the City Attorney sent a cease-and-desist letter in March of last year. Permits were issued in 2000 for painted wall murals on the side of the Figueroa Hotel, but according to the lawsuit those murals were covered by a series of vinyl supergraphic advertising signs beginning in 2008, which violated terms of the permit. The signs advertising products such as movies, women’s clothing, and toilet paper, were removed last year and the murals painted out. Wall murals were permitted at both the 6253 Hollywood Blvd., and 155 W. Washington Blvd. buildings in 1992. The lawsuit alleges that those murals, like the ones on the Figueroa Hotel, were replaced by vinyl supergraphic signs in 2008. The signs were also removed last year. Property owners named in the lawsuit are Mountain Real Estate Assets, Inc.; The New Figueroa Hotel, Inc.; West Washington Properties, LLC, and Vinewood, LLC. CBS Outdoor also owns some 1,600 billboards in L.A., and holds a contract with the Metropolitan Transit Authority (MTA) to install advertising on buses, trains, and transit facilities. The company is a partner with JCDecaux, which has a 20-year contract with the city of L.A. to install bus shelters and other items of street furniture that include commercial advertising. Last year, the company sued the city’s Community Redevelopment Agency, seeking millions in damages it claims it is owed for two wall murals on a building demolished to make way for the Hollywood & Highland entertainment complex.